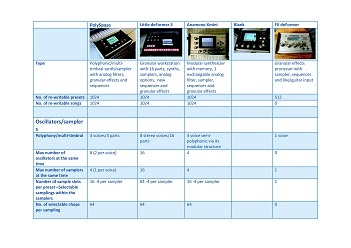 Single filter, LPF, BPF and HPF modes, unique sound, analog distortion and analog positive and negative feedback. On Anamono X go to "More..>Common>Filter Settings", and set either filter 1 or 2 to: 1-Most Filters, depending on in which filter slot you installed it. On Xmini go to "Edit>More...>VCF Type", and set the filter to: 1-Most Filters. 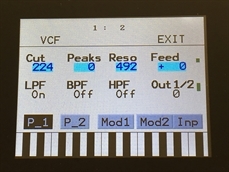 Peaks: Second filter block cutoff frequency, either as an offset to Cut, or as an absolute value, depending on the setting of the Peaks parameter on VCF edit page 2. Cut3/Feed: Negative values: Negative analog feedback, positive values: Positive analog feedback. 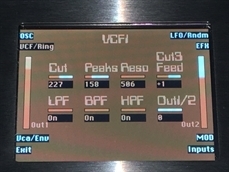 LPF: Switches the filter low pass output on or off. 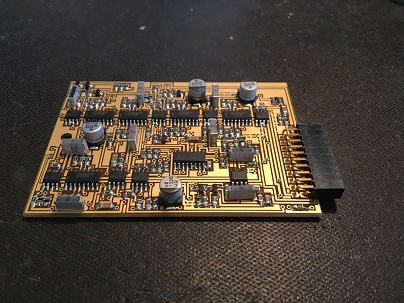 BPF: Switches the filter band pass output on or off. HPF: Switches the filter high pass output on or off. Out1/2: Turns up the analog distortion effect on the filter output 2.